beautiful person - "Did you find him to be a beautiful person?" Lennon was asked. "I think he is," the Beatle replied. Lennon talked at length about the Mosport Peace Festival which he is organizing, and said he was sure it would be a beautiful happening. Lennon said Mr. Trudeau was the first political leader he had met for such a talk. A meeting with Harold Wilson was only to pose for photographs. "Peace to you," he said to the gathered newsmen as he headed for Mr. Munro's office at Tunney's Pasture (PM -- 'a beautiful person'). he was bad - During the Trudeau years in power - April 20, 1968, to June 4, 1979, and March 3, 1980, to June 30, 1984 - the United States had five presidents: Lyndon Johnson, Richard Nixon, Gerald Ford, Jimmy Carter and Ronald Reagan. Duke University historian John Herd Thompson, a fierce critic of Trudeau, acknowledges: "Could there have been a single Canadian who did not reflect with pride at some time during those years that Canada had chosen a better man?" There was no doubt about his style. He slid down banisters, did backflips off diving boards and sat on a rock nibbling reindeer meat in Lapland. He dated Barbra Streisand, Margot Kidder and Liona Boyd. In the House of Commons, he told an opposition MP to "f--- off," in Ottawa he advised protesting strikers "Mangez la merde," and he hoisted a middle finger at demonstrators in Salmon Arm, B.C. He was bad (Trudeau, 30 Years Later). cultural nationalism - Mr. Trudeau was propelled into power in June 1968 by an enthusiastic electoral surge that came to be known as Trudeaumania, a political equivalent of the paroxysms evoked by the Beatles. During his time in office, he determined the substance and tone of the evolving debate that came to define Canada as a modern nation. Long after he left office, Canadian politics were still being pursued within the national agenda he had shaped. 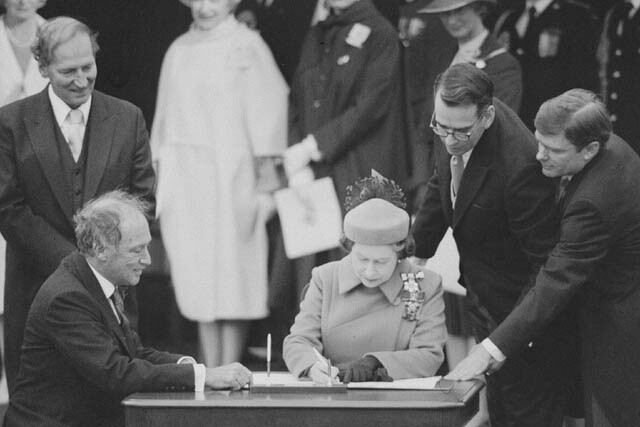 Mr. Trudeau supervised the process by which Canada replaced its ties to Britain with a constitution of its own. He fostered economic and cultural nationalism that often put him and his country at odds with the leadership of Canada's neighbor. While firm in promoting a unified Canada, he was also sensitive to the needs of the mostly French-speaking Quebec. Mr. Trudeau saw to it that the role of the French language was reinforced when the entire country was made officially bilingual in 1984 (Pierre Trudeau Is Dead at 80; Dashing Fighter for Canada). Joseph Philippe Pierre Yves Elliott Trudeau, CC, CH, PC, QC, FSRC (October 18, 1919 – September 28, 2000), usually known as Pierre Trudeau or Pierre Elliott Trudeau, was the 15th Prime Minister of Canada from 20 April 1968 to 4 June 1979, and again from 3 March 1980 to 30 June 1984. Trudeau began his political career campaigning for socialist ideals, but he eventually joined the Liberal Party of Canada when he entered federal politics in the 1960s. He was appointed as Lester Pearson's Parliamentary Secretary, and later became his Minister of Justice. From his base in Montreal, Trudeau took control of the Liberal Party and became a charismatic leader, inspiring "Trudeaumania". 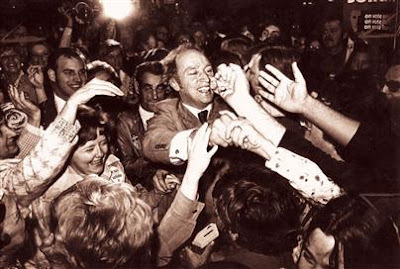 From the late 1960s until the mid-1980s, he dominated the Canadian political scene and aroused passionate reactions. "Reason before passion" was his personal motto. He retired from politics in 1984, and John Turner succeeded him as Prime Minister. Admirers praise the force of Trudeau's intellect and they salute his political acumen in preserving national unity against Quebec separatists, suppressing a violent revolt, and establishing the Charter of Rights and Freedoms within Canada's constitution. His detractors accuse him of arrogance, economic mismanagement, and unduly favouring the authority of the federal government in relation to the provinces, especially in trying to control the oil wealth of the Prairies. (Wikepedia). Who could be the next Liberal leader?